Sam Dickinson can’t wait to square up to one of his former Saints mentors on Friday night. The big No.8 is likely to be in the squad for the trip to face newly-promoted Worcester Warriors. And lying in wait in the Aviva Premiership opener will be the familiar face of Phil Dowson, along with another ex-Northampton player, GJ van Velze. 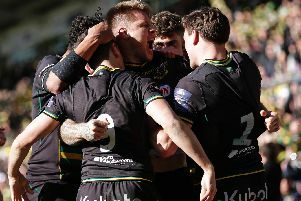 Dickinson says Dowson had a big impact on him during the 34-year-old’s time at Franklin’s Gardens, which came to an end during the summer. And he said: “It’s always fun to play against people you know and there’ll probably be a few personal battles out there. “Hopefully it’ll just be good fun and that there will be a bit of craic between the two teams – I’m sure Dows will be the source of that. It will be interesting to see what happens. “Dows brought a lot of experience and he brought a lot of passion with him and leadership as well. “I think he was someone a lot of the boys looked up to. He definitely helped me – he put his arm around me when I arrived and made sure I knew what I was doing.